Ok, I’m here to pick the brains of pond boss members. 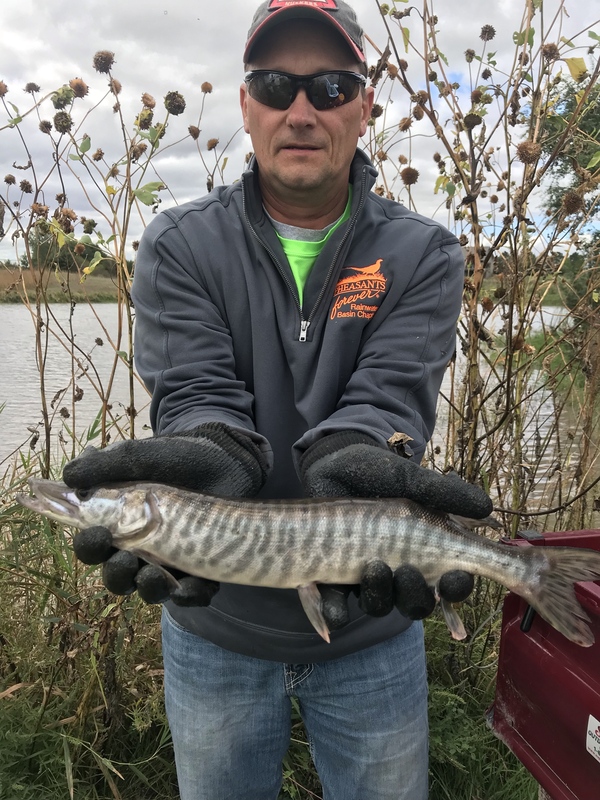 I’ve got 10 Tiger Muskie that are 13-16” long. I’m planning to divide them into 2 groups of five and put them into 2 different 4’ x 4’ x 4’ cages off my dock. My goal is to train them to feed on cut bait. I’ve got a trout farm up the road where I get fresh frozen trout remains every week. Plenty to feed a few Muskie. My questions are..... 1) will they eat cut bait? And 2) how do I go about feeding it to them? In my mind I assume they will eat cut bait because I’ve heard of people catching both pike and pure Muskie on cut bait. So that puts me at question #2.... For a few days I plan to just throw the cut bait in and see if they’ll eat it off the bottom. When I began throwing trout remains to catfish, they were smashing it on the surface in days. Can I expect a similar response with Muskie? Or would I be better served to somehow suspend the cut bait in the cage as if I were fishing it under a bobber, but without a hook? And if I choose to suspend the bait for training purposes, does anyone have any ideas how to do such? Anyway, I wanted to start this thread so I could chronicle my results and share with others that may attempt such a task. Adventuresome, lofty, aspiring project. Good idea but maybe not achievable. IMO you will need to be quite creative to accomplish this with success. The problem as I see it is, the muskie are not a behaviorally aggressive fish as is LMB or HSB. Muskie do chase food but not to the same type predatory behavior as a bass. Muskie are more of a lie & wait, watchful predator rather than a moving stalker/hunter as is a bass. For your sake and project, I hope I am wrong. IMO Muskie approaches food differently than a bass. I think I would first get the musky to adapting to live/survive in a cage,,, which will be a big challenge. Their mentality is to first likely to eat the other sibling/partners until they are the sole inhabitant of the cage. No2 - will be to get them to eat and remain healthy before they develop health problems such as fungus. No3 - I would start first by feeding them live fish. Get them eating asap. 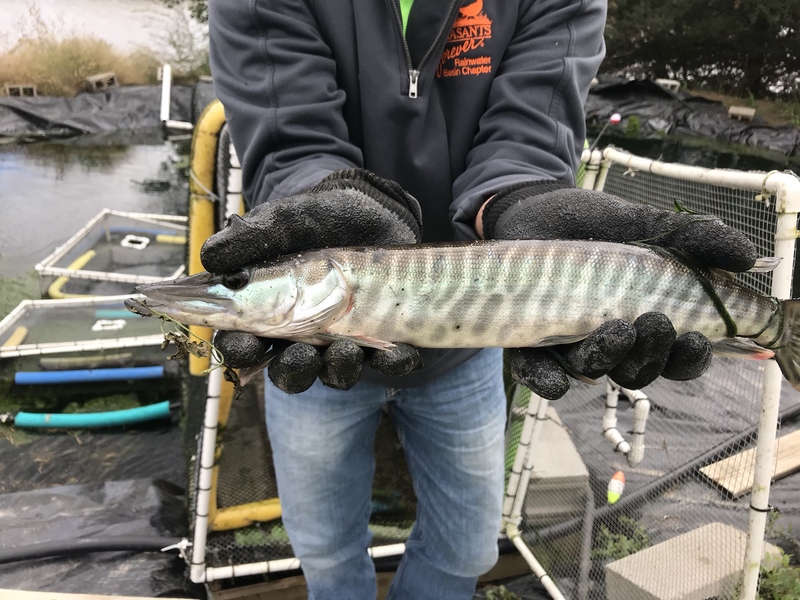 Then when you see them attacking the added live food as soon as it is added to the cage, the muskie are close to accepting anything that wiggles & sinks into the cage. I am very interested in your project and give you high marks for thinking of trying it. I hope it works! Keep us updated. Are your cages built? I would think you'd benefit from having a larger space (6x6x4). 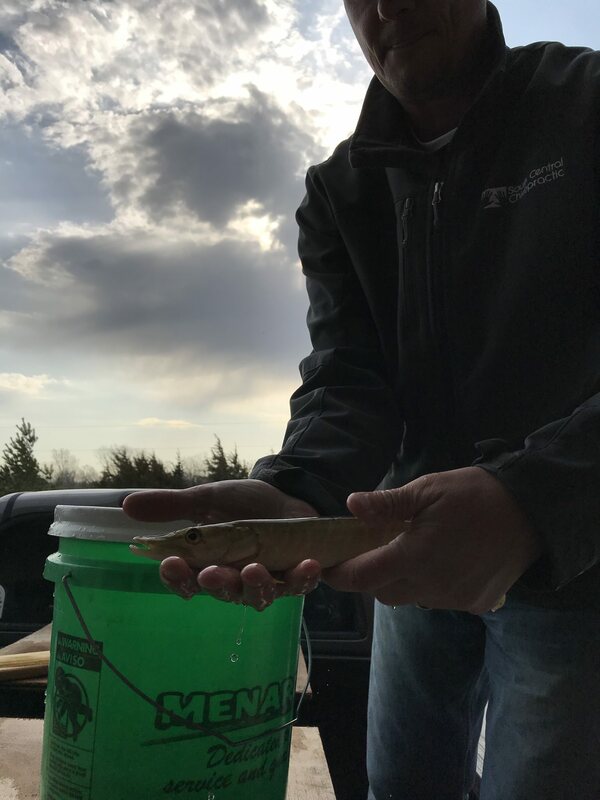 The length of your juvenile muskies will likely be approaching 50% of the "run" you're planning fairly soon. Given Bill's advice on getting them to eventually strike what's dropped in their cage, you'll want space to avoid injury from other fish and the cage itself. Not a perfect comparison, but I can't imagine feeding/growing five young 6" LMB in 20" cube. I'd love to see you get it to work out so I may someday copy you! Well, I'm glad you guys brought this up. Some of these objectives have already been tackled, in a sense. Last fall, a certain dentist that used to frequent this board and I bought 24 Tiger Muskie. Since then they have been in a 6' circumference tank in his basement (1000 gallon or so). He only had one casualty due to it getting stuck on the lip of the tank. They've been eating FHM all winter. He is releasing his in his quarry and we are going to attempt feed training mine in cages. Bill was concerned about cannibalism, as were we. But that hasn't seemed to be an issue. Maybe moving them to a square cage will make it an issue. But I'm hoping not. And they do associate food with people now. So a couple of those hurdles have been addressed. My plan is to throw them in the cages and monitor them. If cannibalism begins I'll either move them to the grow out pond, or release them in my larger pond. Ideally, I'd like to get them trained within a couple months and then move them to my grow out pond for a year or so. Thanks for responding to this post. All input is appreciated. Any possibility of using a large round cage for feed training? My gut feeling is that you would get better results. It appears from the facebook live video last week that this certain Nebraska dentist already has put some tiger muskie in his quarry! They seem to be growing quite well. Awesome project! Okay if the muskie are already in a tank environment then adapting them to cage life should be no problem. They are eating and healthy and feeding - so no problem. I would try to see if they will eat small live sunfish. Then experiment with injuring the introduced live fish so they swim like a dead piece of fish to eventually imitate fish guts. My initial guess is the smaller muskie are males and larger ones females. Yes Bill, I plan to trap some RES and throw them in, in an attempt to hold off cannibalism until they are used to the cage and are willing to attempt cut bait. I believe I'm going to attempt hanging two pieces of cut bait from the lid of the cage, attached to a modified hook that is suspended from a steel leader. I will cut 4" x 4" holes in the lid and hang them from the framing of those holes. This way I can pull them up and monitor feeding activity. I may even leave a couple inches of slack in them so I can attach a float and monitor their feeding activity. If they begin hitting the cut bait as soon as I put it in the cage I'll know I have them trained. I'll be heading to Lincoln tomorrow to get the cages. I'll try to post pictures and videos as I progress. This will be a very interesting and educational project for all readers. Thanks for sharing your experiences! Dentists from Nebraska are all freaks. Very cool. I would love to one day have a Tiger Muskie or two in my lake. Fish are going to be flighty when you approach from above that will cut into their interest in feeding. You could hold the cut bait with a small alligator clip tied to fishing line and wiggle it in front the musk to get them to take it. At some point you want to be able to simply drop pieces in. Feeding method for the pike family just does not work well with feeding small chunks requiring fish to turn around to eat more pieces in rapid succession. You might as well be hand feeding them which can be done. I like the alligator clip idea. Thanks Jim! Post up some videos of the process!! Quick question here. I have the photobucket extension 'fix' added to chrome at home so i can see all the old photobucket pictures from old posts. At work I can see in the post above that below the youtube embedded links in NEDOCs post there are some pictures posted too. At home I can't see those pictures. I also noticed in wbuffetjrs recent posts I can't see the pictures from home but can from work. NEDOC and WBuffet, are you using photobucket for recent image hosting? or is maybe my chrome browser having trouble with another photohosting service? Crazy that I can see at work but not at home in my chrome browser? My most recent pictures are hosted by imgur. It’s not a bad hosting site. Not sure why you’re not seeing it. Anyone else having trouble with the imgur images. I think I made a significant break thru today. After a text conversation with TJ today he suggested using worms. By the time I got to my third worm the musky were trained and hitting it within 20 seconds. Now I can thoroughly get them to associate food with alligator clips or me throwing items in the water. I plan to train them to respond to both having worms on clips and me throwing worms in the water. Then I hope to add a sound such as a bell to feeding time so they will have another sense to associate with food. I’ll try to convert them to chunks of trout that I have access to over time. No idea how I will introduce the fish to my large pond and keep them on the diet I’ve trained them on but I’ll cross that bridge when I get to it. And what I was hoping to evolve to is having them hit strips of meat as I throw it into their cage. In this case it was a strip of tilapia. And they were only hitting about 50% of the ones I threw in. But 1) they may have been full and 2) it'll take some acclimation. Oh when I wash my hands off after handling those worms and such, you better believe I do it outside of the cage. LOL. Repetition and patience in training is a key part of the process. Very interesting and educational posts. Many thanks from all. One suggestion. When you clip the meat,,, only clip a very thin sliver of the meat so a very light tug from the fish releases the meat. It appears from the video the clip is grabbing too much of a portion of the meat. How often do you feed the meat pieces? and how much meat each time? To how many musky in the cage? Are you thinking all musky are getting pieces of meat? Those are great questions that I largely don't have answers to at this time. Much of this all began taking place just yesterday. I'll do the best I can at answering them now and will come back and update it as I progress. I try to feed the muskie toward dark, largely because they feed higher in the water column toward dusk so I get better observation. But some days I feed mid day, some days I don't feed at all, and some days I feed multiple times. This is largely due to my erratic schedule. I'm sure I could do better if I was more consistent, but that isn't happening until my boys are old enough to do this themselves, in the mornings. I had been feeding about 10-18 worms each day. As far as sizes of meat, I was varying sizes last night, with no noticeable difference in their interest. Obviously, I'd like them to progress to larger chunks to make the process more efficient for me. But it's a work in progress. I have 2 cages. 8 TM per cage. The one cage of fish I have put my time and effort toward and chronicled above, the other one has largely gone ignored. Only occasionally putting worms on floats, which they'll eat after I leave the scene. Not sure if I should mix the fish next and hope those learn from the trained ones, or begin the training process on them. Maybe get advice here for the best way to proceed. I really don't know how many are trained to eat yet. In one of the videos above, you can see 4 separate fish around the meat. So I'm assuming there are at minimum 4 trained. I'm assuming some won't train and will be cannibalized, but will find out as time goes on. I do hope to get 2 more cages from Dr. Condello and go to 4 TM per cage at some point. Thanks for the dialogue fellas. Always glad to have people pitch in with ideas. And I'm certainly counting on Mr. Cody to share his expertise. Soon, Dr. Condello and I would like to acquire TM fingerlings, and begin this process in his tank at a much earlier stage in life. If these train as well as I'm hoping I'll build a grow out pond for them so we can get a season or two in the grow out pond before releasing. Just typing this in for future reference in case anyone attempts this in the future, and in response to Bill Cody above... tonight I cut up one tilapia fillet into 30 small, thin, worm shaped pieces. Out of the 30 pieces that I threw in and let free fall through the water column, I observed 27 of them eaten. The other 3 pieces may have been eaten but they had gotten deep enough that I couldn’t observe them getting eaten. Now onto training them to eat the trout waste I have access to. First try using some of the stringy guts very, very lightly held to the clip so it takes very little effort to get it off the clip. You may first need to clip the trout parts and shake them to imitate something live to get the TM accustomed to eating the parts. That’s a good idea Bill. I may file down the small teeth on the alligator clips also. I have had them hit a few belly strips falling through the water column. So I think with repetition I won’t even need to clip them. I could just throw pieces in one or two at a time. Truth be told, I’m so damn excited that I’ve been dreaming Muskie for 3 nights now. It’s disrupting my parenting. Lol. Update: They're taking larger strips of tilapia now, and noticeably more aggressive. Soon I'll be shifting to a diet heavier in chunks of trout that I get from nearby commercial fish farm and strips of catfish fillets that I've culled from my larger pond. I really wish video showed it as well as what I can see it through polarized lenses. You can really learn a lot about muskie by going through this. NEDOC, many have found that if you put the camera lens on the backside of the polarized glasses lens you can get pictures that match what you see when your sunglasses are on! CC, seems like common sense. Not sure why I hadn't done that!! I'll try it for the next video update. So it appears like they've continued to progress in their willingness to take offered feed, eh? Any cannibalization so far? Have you been checking body condition or relative weights yet? Just curious. Definitely progressing in their willingness to take feed. In fact there’s generally a noticeable increase with each feeding. There has been no cannibalizism at all. I have done absolutely no studies on relative weights or body condition as I’ve tried to minimize any contact with them. I’m a bit fearful of stressing them any further. This looks to be an annual project so I may look into relative weights and such in future years. Good point on the stressing, and avoiding it. Wonder if a guy could tare the weight of the cage, and then just lift and weigh the cage with the fish in it for a few seconds. Wouldn't give the individual weights, but could document wt trend overall. But not sure if that would be helpful enough information to bother with. Love the videos! Might be cool to try the polarized lens trick like Canyon suggested..
Super cool Corey...I'm a tad worried about our extended forecast and rising water temps stressing the TM - I'm not sure on TM tolerance for water temps. If they stop feeding I'd take this as a sign to release in one of your new cells. Just a thought. TJ I’ve got that covered. As you know we’ve got good access to the aquifer down here. And as you also know my grow out ponds spill into my large pond. So instead of spending money on a traditional aeration system, I went the cheap route and fabricated a horizontal aeration system for my grow out pond that I turn on during warm days. Essentially I use the pressure from my well to ‘push’ the water around my grow out pond creating a lazy river effect. A few advantages to doing so.... 1) less money spent in the short term 2) flush nutrients 3) ability to lower water temps and 4) overflow helps keep my big pond from dropping as much. PS. They are in one of my ‘new cells’ in cages. And it appears that our BGxRES experiment may fail. (Sorry snrub). So the TM may end up being released into that pond. Which is 600 sq ft.
Great progress with training the muskie. Progressing quickly now to larger chunks and more frequent feedings. And cage #2 is beginning to feed well now also. Went through nearly 3/4 lb of trout chunks today. Seems growth is inevitable if that keeps up. So I’m planning to add 2 more cages in a couple days and have 4 fish per cage rather than 8. Feeding on larger chunks is a huge advantage to me as I spend a good portion of my time cutting up strips of trout or tilapia. So these recent developments are nice. Can’t wait til their gape allows an entire trout head to be consumed. Check this out. This was just the first one I pulled up, but they have them for all types of phones these days. May be a little easier, but more expensive, than filming through your sunglasses. It would be really cool to be able to see the fish hitting the chunks! That’s cool as heck!! I’ll be able to do it thru my sunglasses. I just had my son filming today. And it’s risky enough having a 7 year old filming over water. Asking him to do it over sunglasses would definitely lead to disaster. And I’ve got a bloom going on right now. So I’m not sure how well it’d work anyway. Just a couple updated videos of us playing around. The first one is a tadpole on an alligator clip. You can see they are getting super aggressive. And the second one is feeding tilapia strips. For some odd reason the TM don't feed very well unless the lid of the cage is open. Strange. Looking really good! How well do they seem to be growing? Coping with the cage and the water temps/summer heat ok? Thanks for the tadpole experiment...cool project too! Luke, it’s kinda hard for me to tell how much they’re growing as I didn’t weigh or measure. The last I picked up the cage they did appear noticeable thicker but not noticeably longer that I could tell. But they hadn’t started to feed as aggressively at that time. Now I’m going thru 1/4-1/2 lb of meat per day (16 Muskie total). So I’ve gotta think they’ll be bulking up. Water temps are fine as when it warms up I add well water thru a horizontal aeration system I’ve designed. It seems to be working well. they sure look more aggressive via videos. Do you have a specific end point/release time in mind? When they come out of the cages, I wonder how they'll do regarding localizing to the feeding station. I always seem to find the fridge without too much difficulty..
I’m considering releasing them from cages into my smallest (600 sq ft) grow out pond in late September. It’s about 6 ft deep so I think I could over winter them. If I run a small aquarium air stone off the dock I think I could keep a very small area of water open and continue feeding them thru the winter. Either that or just release them into my 15 acre pond and say good bye. To be honest I’m not sure what my end game is as this project has probably been a bit more successful than anticipated. Awesome Corey! Will your TM actually eat the BG tadpole? If so, that will be the first time I've ever actually witnessed the event. Will the TM eat the trout organs? Is TP the most preferred? I have tried many different approaches myself, and ofc their favorite is also the most expensive....TP. 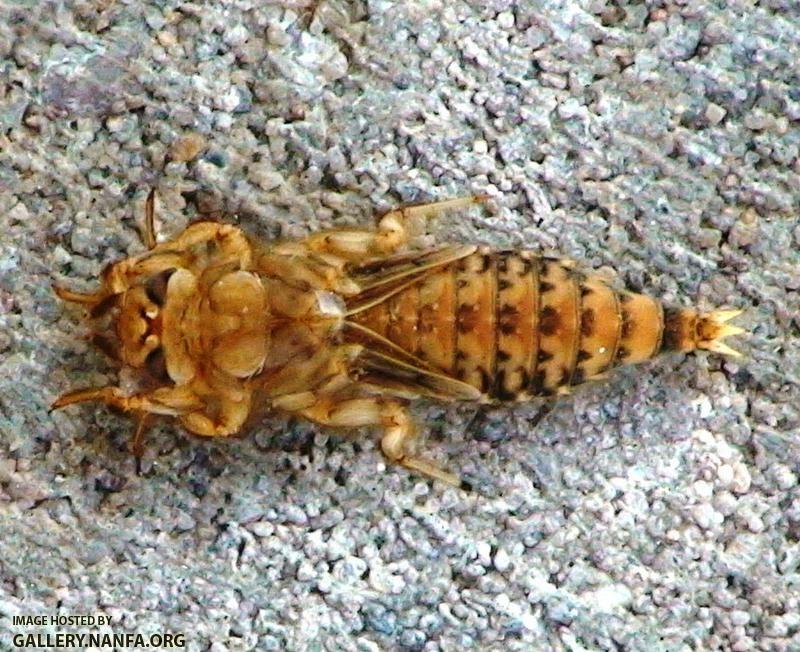 They seem to eat trout parts and pieces nearly as well as the tilapia. I just didn’t have access to trout parts for a couple weeks due to them taking time off from cleaning them. Will probably resume trout tonight or tomorrow. From what I can tell they eat the tadpoles at times. Other times they kill them and spit them out. You up for putting one of these in your pond TJ? I understand if you don’t for obvious reasons. But thought you could try it for a bit and abort if there are negative consequences. I'm trying to get my YP population back to robust numbers, but I could sure give one a try. If I need to remove Condello can cast once and catch it. 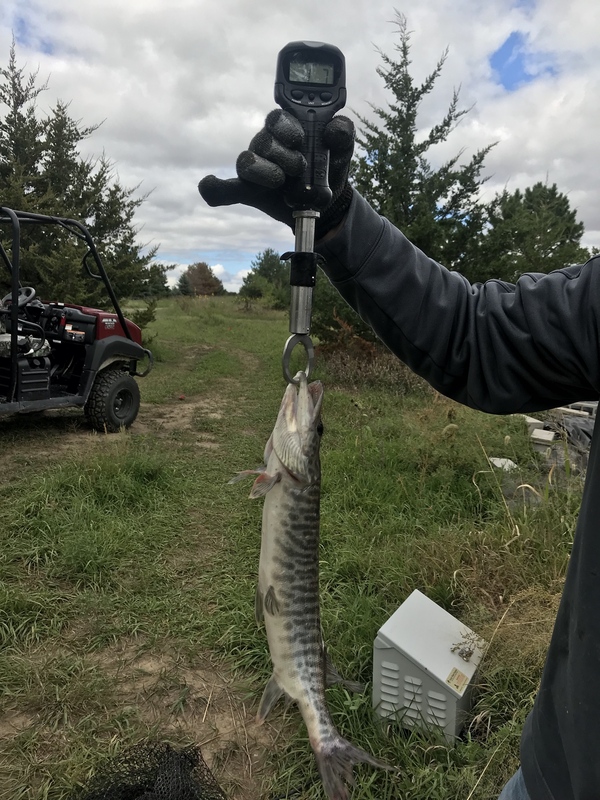 Just wanted to archive this link in here for future reference regarding tiger Muskie controlling trash fish and discussing stocking densities. Discussions of stocking rates anywhere from 4-30 TM per acre. I apologize in advance for not chronicling this better, but the way I’ve designed my cages with feed windows it’s difficult to get video or pictures of the fish. I will say they’re doing incredibly well. All 16 are still alive, have tremendous coloring and are incredibly thick. I’m guessing they’ve tripled their weight (the largest ones) since I began this project this spring. I’ve continued to feed chunks of tilapia off of alligator clips and they average 20-30oz (maybe more) of consumption per week between all of them. So that brings me to my update... curiousity got the best of me and I was wondering if I could convert them to a prepared feed. I had an idea that I quit feeding tilapia for a few days and begin throwing worms in again then progress from there. Last Friday was my last feeding of tilapia. Sunday thru Tuesday I fed them 2 dozen worms (6 per feeding and 4 different feedings). I had a couple hits out of those 24, but nothing terribly exciting. Well tonight curiousity got the best of me... I took some hydrated Optimal Grower #2 and formed it into earthworm like shapes. To my amazement the first 2 I threw in were smashed by the Muskie. I made 9 pieces total and I observed 5 of them get taken. The others may have gotten taken but had dropped out of sight. Not sure if the taste of it will leave them craving more or scare them off. But I was very excited about this development! Hopefully more exciting updates to come. Thanks for listening. Do you think a GoPro on a stick stuck underwater could get good footage? That would be very cool!! I think it would after they were acclimated to it. But I don't have a GoPro!! After thinking it over for a night, I think I'm going to further this experiment and have one of the cages fed hydrated food only, another cage tilapia only and then the third cage I will mix the two types of feed. That way if anyone is ever dumb enough to try this again, they may know which method is better. That is assuming one of the methods is significantly better. This has to be getting $$$. It’s costing me about $6-7 per week. Cheaper than any of my other hobbies LOL. Heck, that's not bad. I spend more than that daily shooting. NEDOC - Excellent work and progress so far! Keep us updated. 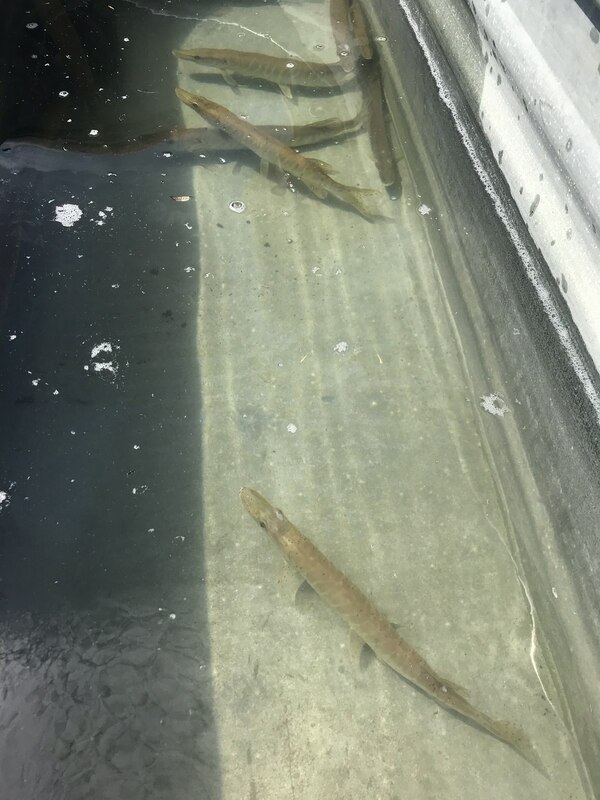 So I had one tiger muskie die, and another not looking well so I thought it may be time to release them. I'm suspecting I may have had some nitrate issues in my grow out pond. Not sure how I plan to remedy that going forward. But that's for a different discussion. Anyway, I did get to weigh and measure one that I felt was average. It was 17-17.5" long and 1-8. Which from what I've read is right where they should be at this stage of development. So here's the official end of my first year of raising tiger muskie on tilapia. Hopefully my next photo is of someone catching one next spring. And we do have more on order for next year. So I hope to continue this next year. Thanks for all of the input fellow pondbossers. PS If someone can find a cooler freshwater predator than a Tiger Muskie, let me know. Just an incredibly beautiful fish. And pretty bad @ss. Those are some really cool fish. Congrats on a job well done. I'm amazed that you could raise that many of that size fish in the size grow out pond you have.